Warm-up gig in LA on Friday April 1? - CONFIRMED! The Internet is full of rumours of a secret warm-up gig at a smaller LA club to tomorrow. Re: Warm-up gig in LA on Friday April 1? - CONFIRMED! @Soulmonster wrote: The Internet is full of rumours of a secret warm-up gig at a smaller LA club to tomorrow. Of course you would have to be certain to be able to attend the gig (if it happens). But then it wouldn't really be a "secret gig" any more. That's true. It would have been crazy to just travel there hoping to get a ticket. 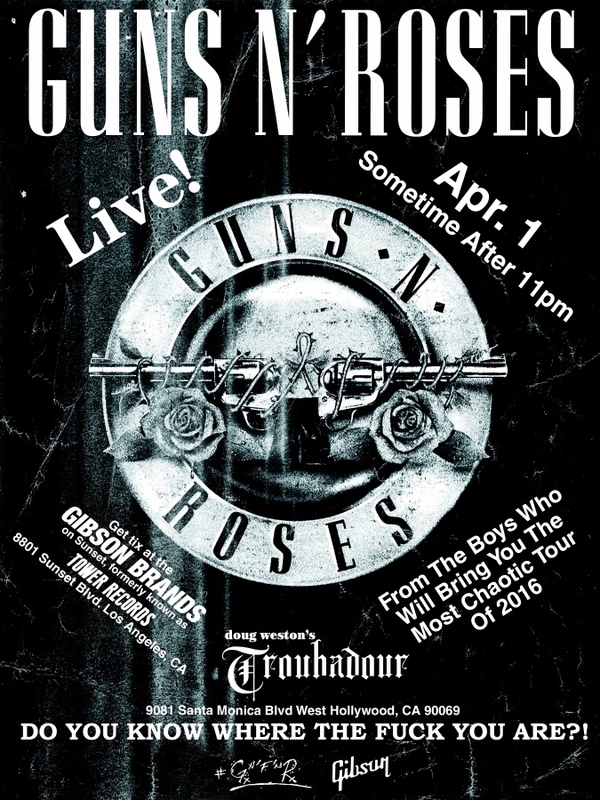 Detectives over at Mygnrforum has identified a show tomorrow at the Trubadour as most likely to be GN'R. It is marked as "Girl Rock School", or something similar, and apparently sold out. They believe this is just a hoax and that it really is GN'R. Apparently Axl posted a pic of "troubadours" (musicians back in mediaeval times). Rumours keep floating, but it looks like this really will happen! Edit: it was not Axl who'd posted that pic. Another rumour talks about them playing on the roof of Tower Records. Rumours say press conference in afternoon (i.e. late at night here) then Troubadour show later. Edit: Tower Records is not existent anymore (they say) but it's the old building, might hold the press conference there? The rumours says a press conference followed by a show at the Trubadour. Wow. Periscope form a lady in the queue for tickets outside Tower records. What's that? Probably a tool I don't have. The location of the old Tower Records on the Sunset Strip in California will be the site of an announcement this morning of a special GUNS N' ROSES concert, to be held tonight (Friday, April 1), possibly at the Troubadour in West Hollywood. 250 tickets are expected to be given away at noon — on a first-come, first-served basis, apparently limited to one ticket per person — for the show, which will mark the first time singer Axl Rose and guitarist Slash have performed together since 1993. With the first official GUNS N' ROSES reunion concert scheduled for just a week from now, on April 8 in Las Vegas, the band has still not officially announced the lineup of musicians who will take the stage beyond Rose, Slash and bassist Duff McKagan. But a photo posted at the group's official Twitter account sent fans into a frenzy. The picture of Ahead brand drumsticks fueled speculation that original drummer Steven Adler was returning to the group, especially after past and present GUNS drummers Matt Sorum and Frank Ferrer both denied they used the sticks. Ok. Well, I guess most of it will turn up on youtube later... I'm not staying up all night anyway! Neither am I. But there is a good chance they will be very strict with taking away phones, so maybe there will be no footage? Guns N’ Roses will be performing an unexpected concert in Los Angeles tonight, a rep for the band has confirmed to ABC Radio. The band will be making an announcement about the show at the location of the old Tower Records on the Sunset Strip at 10 a.m. PT. Tickets to the show will be given out at noon. But will it be a reunion gig, i.e. with Steven/Matt and Izzy, or the rumoured hybrid lineup?